These addictive little morsels won a prize in a Betty Crocker Cookie Contest that I entered years ago. It starts with a sugar cookie mix, which makes them easy to prepare. The cookie base is semi-baked, then topped with cocktail peanuts, chocolate chips, caramel ice cream topping, a sprinkling of sea salt, and then returned to the oven to bake into ooey gooey bites of salty-sweet goodness. The cookies can be cut into pieces or, how I like them, broken apart like peanut brittle. The cookies are called Salty Caramel Peanut Brittle Bars. They make a great gift for friends, a cookie exchange, or to share with your family. Betcha’ can’t eat just one! Heat oven to 350 degrees. Line a jelly roll pan (15-by-10-by-1-inch) with foil, extending the foil over edges of pan. Lightly grease foil; set aside. (note: if you use the special non-stick kind of foil, you won’t need to grease it). Place cookie mix in a large mixing bowl. Remove 3 Tablespoons of the mix to a small bowl and set aside. To the cookie mix in the large mixing bowl, add the brown sugar and mix until blended. Using a pastry blender or 2 knives, cut in the cold butter until mixture forms coarse crumbs. Press mixture evenly into prepared baking pan. Bake for 15 minutes. 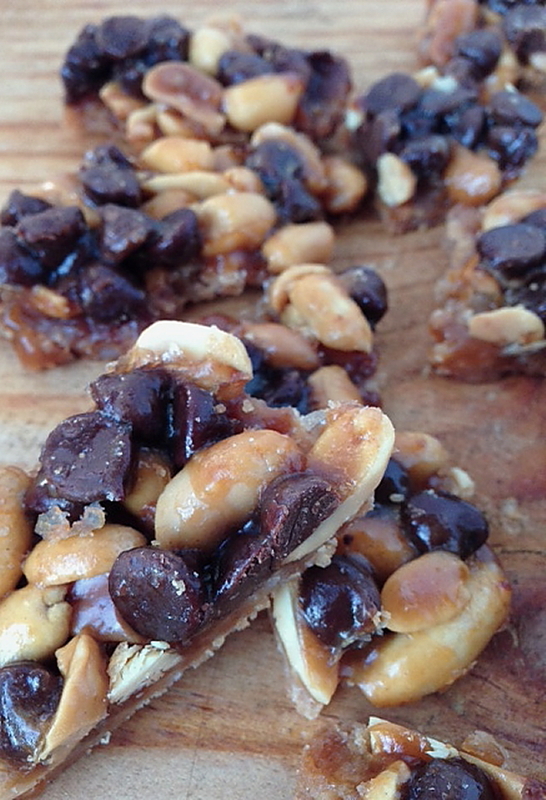 Remove pan from oven and sprinkle evenly with peanuts and chocolate chips over the hot crust. Stir the caramel ice cream topping into the reserved 3 Tablespoons of cookie mix. Drizzle evenly over peanuts and chocolate chips. Sprinkle evenly with the sea salt. Return to oven and bake another 13-15 minutes or until nicely browned around the edges and caramel is bubbly. Cool completely on a wire rack. Use foil edges to lift baked mixture from the pan and set on a work surface. 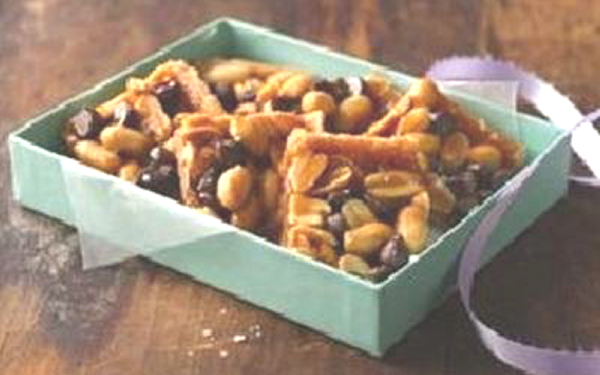 Peel foil from the sides and cut into bars or break into pieces like peanut brittle. Store cookies in an airtight container at room temperature or in the refrigerator. I was looking for a new cookie for my cookie exchange. These sound yummy. I am no cook but I think I can do this. I don’t have a jelly roll pan. Is there an alternative I could use? Hi Marilyn! I’m so happy to hear from you after many decades! I’m also happy you would like to try the cookies – and yes – they are super easy, even for non-cooks. About the pan, unfortunately the jelly roll size pan is perfect for these cookies because another pan like a 9-by-13 would make the crust too thick. The jelly roll pan keeps a thin crust so when the cookies are done, they can break apart more easily. I was thinking about you today when I was in Macy’s looking at bakeware and came across a jelly roll pan. You can get inexpensive ones at Target or other stores, so you might think about buying one. Those size pans are good for lots of other things, too. I think you would like having one. I have never tried the recipe in any other size pan, so I am not much help in what other size to use to make the crust come out right. If you happen to have a shallow roasting pan that is around 15″-by-11″ it might work. Thanks Debbie. Great to hear from you. I appreciate the advice and will invest in a pan. Merry Christmas! Merry Christmas, Marilyn! Let me know how they turn out! Those look delicious and may have to be added to my holiday cookie repertoire. On the subject of jelly roll pans, I use Cuisinart nonstick pans that I found at TJ Maxx for $8 or $9. The quality is great – they’re a bit thicker than inexpensive pans so whatever you’re baking on them is less likely to over-brown – and I’ve never had anything stick to them. TJ Maxx and Marshall’s are great places to find quality cookware at bargain prices. I once found a Mauviel copper saucepan at Marshall’s for about one-fourth the price of the pan at Williams Sonoma. Madonna, I need to go shopping with you sometime and find your bargains. Yes, Debbie, we definitely need to do some culinary shopping together. I need to post photos of my new Christmas dinnerware and the beautiful pasta set I found at Marshall’s. I also picked up some new cookbooks there — Deborah Madison’s “Vegetable Literacy” and Williams Sonoma’s “Vegetable of the Day.” Since I’ve taken up gardening, I’m trying to incorporate more vegetables into our diet and am always in search of new ways to prepare them.